One of my central reasons for choosing this marathon was to catch up with the original adaptation of H.G. Wells' The Time Machine. That landmark book offers a remarkable vision of our future from a turn-of-the-century perspective. While I'm interested in learning what changes were made for the 2002 Simon Wells version with Guy Pearce, pretty much everyone says that it's a poor imitation. So I've decided to stick with the original to find out what happens when a time traveler journeys far into our world's future. Let's get to the questions before the brutal Morlocks drag me underground! 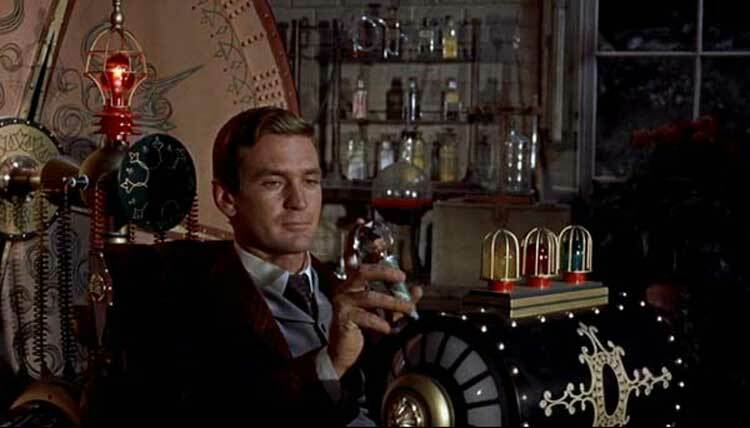 H. George Wells (Rod Taylor) discovers the secrets of time travel at the turn of the century and has created a "time sled" to make that journey. After trying to convince his skeptical friends, he visits several future wars and witnesses the apocalypse in 1966. Going forward more than 800,000 years, George observes the lush renewal of Earth. 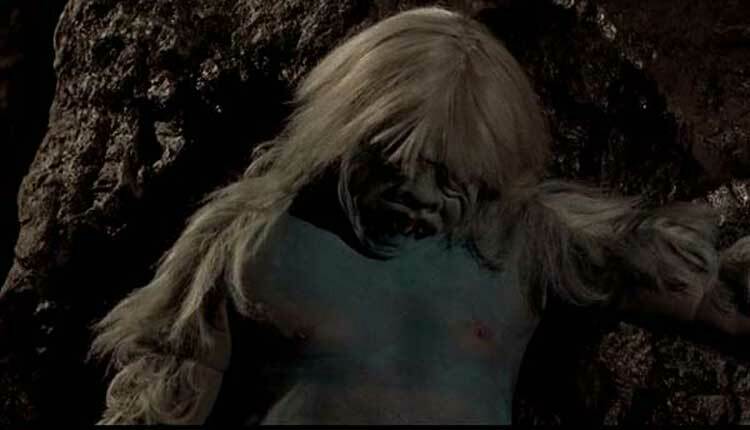 He also meets the mild-mannered but dim-witted Eloi, including the attractive Weena (Yvette Mimieux). Their life seems comfortable, but they're controlled by the nasty Morlocks, who steal them away for nefarious purposes. George must go underground to recover his time sled or he'll never make it back to his own time. A cruder version of the Delorean, the time sled allows George to determine his destination by controlling the speed in which he moves through time. He's not creating a wormhole to jump directly into another era. Instead, he observes time passing at a faster pace while he travels into the future. This is an effective approach and leads to some great stop-motion animation to sell the effect. Director George Pal (7 Faces of Dr. Lao) is an expert at this type of special effect and shot numerous short films incorporating these methods during his career. This success really sells the time travel without pulling us out of the movie. Unlike bombastic modern-day CGI, the practical effects are understated and show a master at work. Arriving during several world wars, including the end of life as we know it, George cares little for his safety and bumbles into danger. There's something endearing about George's innocence as he faces strange new experiences. This is not your typical scientist who views the world from a detached perspective. Several of his buddies seem like idiots, so I'd try to avoid those guys if possible. Weena is friendly and good-looking, but her personality is limited. It's not really her fault, and Mimieux sells her innocence well. She does have more charisma than the blond-haired, blue-eyed dudes of her people. It's strange that everyone looks like the model of the Aryan race, though I expect it may relate to the limited people who survived the destruction. Considering that this movie was released more than 50 years ago, the effects are pretty impressive. Watching George's house change and then eventually disappear is thrilling and shows a real artist at work. The sets in the far-future are grand without being ridiculous. His first arrival to an apparently deserted Earth is eerie and cleverly implies a scope much larger than we see. There's also a fun moment in the beginning where George shows his friends a mini-version of the time sled and sends that device forward in time. Their exasperated reactions don't deter him from taking the real machine out for a spin. Most of George's early stops occur during wars, and he barely ventures beyond the street in front of his house. It does seem a bit incredible that the same clothing store remains nearby for more than 60 years. It also keeps a mannequin placed in the identical spot for the entire run. This device gives Pal a chance to show the passing of time through its change of clothes. 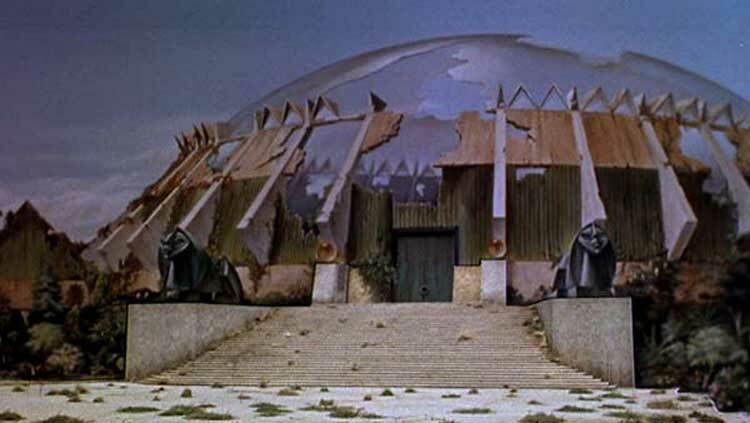 The far-future resembles an episode of the original series of Star Trek, particularly the Morlocks' underground lair. These nasty humanoid creatures are only on screen for a short time, and it's probably a wise idea. They're hokey and don't really inspire the menace that's needed to frighten us. Because George barely ventures far beyond his house, there aren't really any flaws with the timeline. Even if you consider the future events unavoidable, he actually doesn't change anything beyond his own disappearance. It's interesting that George witnesses the end of the world in the '60s and doesn't try to stop it. He could visit the future and learn key details about what caused the destruction. It's possible that he couldn't stop the expected future, but I'm surprised he didn't even consider it. Released during the heights of the Cold War, this film does focus more on war and the apocalypse than Wells' novel. I enjoyed The Time Machine more than I expected, especially due to the impressive animation. There are some hokey moments, especially with the love story, but Pal and Writer David Duncan keep it from becoming too campy. They generally strike the right balance and employ a brisk pace to keep us engaged until the end. ANy talk of H G Wells just makes me think of Warehouse 13 now and that annoying actress playing HG. I actually don't mind HG Wells on Warehouse 13, though I do think she could have been written better. I like Time Bandits. I saw it as a kid and was pretty freaked out, but I liked it more when I revisited it a few years ago. It definitely has Gilliam's unique touches all over it, especially the bleak and fairly comic ending. I think it is more the Actress that puts me off. I have seen her make her way to USA and I hated her when she was still in UK shows. it is her little front teeth that put me off...She was bonkers in Dexter too! Have not seen this yet, but have noted it down to watch! I think it's worth seeing for sure, especially since it's influenced a lot of other movies. The stop-motion animation was great too. If you get to see, let me know what you think!